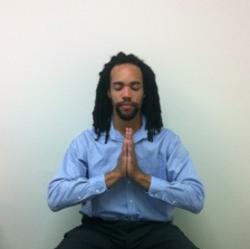 He has extensive experience with both private one-on-one sessions and public classes and has taught seminars and corporate wellness programs at Boston Public Schools, Oberlin College, Harvard Divinity School’s Reiki Association (2006), St. Francis House, Action for Boston Community Development, and Boston Medical Center. He has created and implemented many programs integrating Traditional Healing Methods in modern contexts including an ongoing Yoga program for the MIT Track/ Field and Cross Country Teams. As a result of this journey he has identified the overwhelming need to bring alternative healing modalities into impoverished communities and to victims of violent crimes. In his private practice he routinely treats patients who suffer from; high levels of stress, cancer, arthritis, asthma, chronic diseases, obesity, psychological disorders and survivors of domestic violence. Edmonds has also brought his expertise in Traditional Healing to bear in work with gangs, senior citizens, and homeless people. He is committed to service in his community and to offering alternative healing as a practical means to end stress, treat illness, speed convalescence and recover a healthy balanced life. In his spare time Ivor enjoys playing chess, camping, live music, dancing, volunteering, and cooking.